Johnson's Baby Shampoo - 300 ml | Multicolour | Gentle and mild to the eyes as pure water. Clean your little one's hair thoroughly and keep them soft and nourished using this baby shampoo. It is gentle and mild to the eyes as pure water and leaves your baby’s hair smelling fresh. 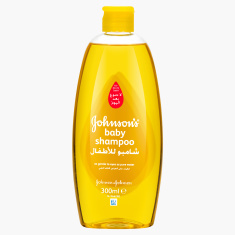 This shampoo lends a soft and shiny look to your baby's hair.